Where Should the Chuck Brown Mural Be Relocated | Park View, D.C.
Chuck Brown mural at the old Sweet Mango. We are still many months away before the 3701 New Hampshire Avenue site is redeveloped. 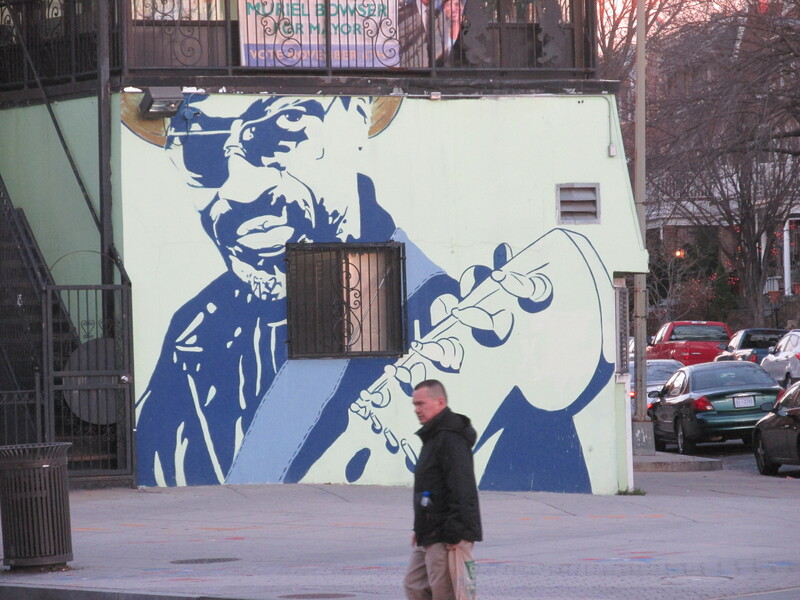 One of the issues that came up during the zoning variance process was the Chuck Brown mural at New Hampshire and Rock Creek Church Road. Throughout the process, community members have advocated for the mural to be saved and the developer has agreed to have the mural recreated. Yet, where that mural would go is anyone’s guess. The easiest place would be on the northeast side of the new building after its finished. However, that would mean that the community would be without the mural for about 18 months and the new mural wouldn’t face the Georgia, New Hampshire, Rock Creek Church Road intersection. 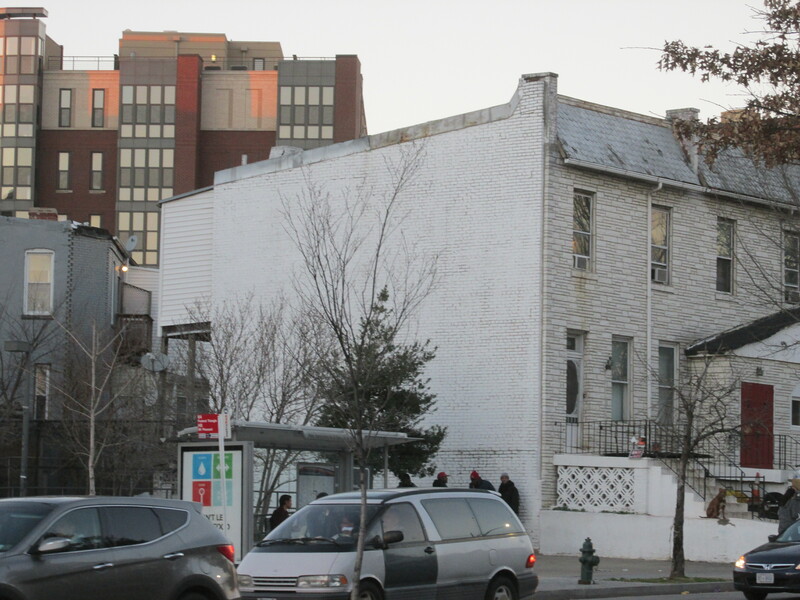 Over the weekend, I noticed that the rowhouse structures across New Hampshire Avenue from the former Sweet Mango has a big empty wall facing the same intersection. While it is somewhat obscured from the intersection by the Metro station entrance from certain angles, it also is very visible from other angles. The more I thought about this the more I liked it. Not only is the orientation similar to the current mural, it would also be the first thing Metro riders exiting the station would see when they visit the neighborhood, perhaps bringing more prominence to the mural. Lastly, if the owners allow it, the new mural could be created before the original is destroyed, ensuring that it remains visible throughout the process. Can anyone think of other suitable locations for the mural? This entry was posted on January 5, 2016 at 7:01 am and is filed under Art, Murals. You can subscribe via RSS 2.0 feed to this post's comments. I really don’t see the value of engaging in a process to recreate a couple year old mural without significant ties to the neighborhood. I may be missing something or not understanding the significance of the said mural so please enlighten if I’m off. Kent, love your suggestion for the relocation of the mural! Who cares where it goes? I certainly don’t. Even the family of Chuck Brown said it had no significance to them. It’s not like its historical… Plus it’s private property. Another example of certain neighbors trying their best to stop any and all development along Georgia Avenue. Hi Kent – Tom and I have looked at that wall for a future mural, too! Though we recognize that property is also private property and would need outreach to its owners.